Advertised as “The biggest little man in the world of adventure 8 inches tall – All Action Jackson figures are fully jointed and completely posable”. 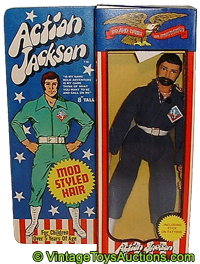 Action Jackson was one of the first action figures to be produced by toy maker Mego. It was intended to be a small, cheap substitute for GI Joe Adventure series. The figure was first released in 1970 alongside an array of figures and related items. The figure was designed in a variety of hair colors which ranged from black to blonde, and in some cases even red. In addition, these figures were designed with and without beards. Action Jackson was designed to be a flexible, multi-tasking figure that would appeal to the ego of boys who loved adventure. Boys are fascinated by heroic figures and Action Jackson was a “must have doll” for them. Since it was first released in the early seventies, Action Jackson was an instant hit. Sales figures from Giant toy maker Mego indicated that more than two million Action Jackson figures were sold. In spite of the good sales, these figures did not last for long. Although it was regarded as a flop, it contributed significantly to the idea of using a simple body on different characters. A complete play set of Action Jackson figures consisted of cars, outfits, and other toys. Action Jackson was sold boxed. The figures came wearing a number of outfits. The most popular outfit he adorned was a light blue jumper, white boots, and a white belt. There were two Action Jackson figures one in black and the other one in white. The black figure was almost double the price of the white figure although they had a similar configuration. Mego developed several vehicles for Action Jackson. Most of these vehicles sold poorly and you can still find them at a low price. The vehicles comprised of; fire rescue, wild mustang, scramble, cycle parachute plunge, and many others. In spite of the decline in demand for Action Jackson figures, Mego attempted to recover from its losing streak by incorporating the bodies of Action Jackson figures in different figures in the World’s Greatest Super heroes. This new set of toys was released in 1973. The toy line was a major success and sales were great in the following years. In 2000, Playing Mantis a toy making company produced newer versions of Action Jackson figures. These new figures included more accessories than its earlier version. Just like the original version, this version however was unsuccessful and it was eventually dropped. An interesting occurrence that happened back then is that, Action Jackson figures were used in a television commercial against advertising rules. At that time, toys were no longer supposed to be depicted in commercials. The logic was that the products could not actually perform any actions and it was inappropriate to use them in commercials. There were other items which were also produced and they included playsets. Surprising enough, a female substitute of Jackson called Dinah-Mite was introduced at this time. Sadly, the Action Jackson figures and legacy diminished in influence which led to its demise in 1973. This action line will remain a lasting legacy of Mego collectibles today. I found this great site that showcases only the best Action Jackson auctions. Team also suggest that you sign up for the Action Jackson newsletter.